Emily Naviasky was selected as the student speaker for the 2014 A. James Clark School of Engineering Winter Commencement. Emily Naviasky, receiving a double degree in electrical engineering and computer science, will deliver the Clark School of Engineering Commencement Address at the Winter Commencement on December 21, 2014. 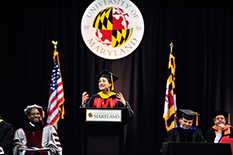 Throughout her University of Maryland career, Naviasky has been very involved in both the Department of Electrical and Computer Engineering and the Department of Computer Science. She has taken part in the Honors College Gemstone program by participating in research to motivate and monitor physical therapy patients during exercise. In 2013, she was selected to be a University of Maryland MERIT Scholar and spent the summer participating in sensor design research with her mentor, electrical engineering professor, Dr. Pamela Abshire (ECE/ISR). Following that experience, Naviasky was chosen to present her research at the Grace Hopper Conference. In addition, that same research was published at two conferences: the International Symposium on Circuits and Systems (ISCAS) and Biomedical Circuits and Systems (BIOCAS). For the past two and a half years, Emily has served the Department of Electrical and Computer Engineering as an Undergraduate Teaching Fellow teaching impressionable undergraduate minds how to “less frequently burn circuits”. She has also been active in the ECE Student Leaders program and assisted in department recruitment efforts. Emily interned at Intelligent Automation Inc., and more recently at Amazon’s Lab 126, an inventive research and development company that designs and engineers consumer electronic devices. Following her commencement, Emily will be working in Austin, Texas at Silicon Labs to prototype and demo RF chips. In the fall, she plans to pursue a Master’s degree in electrical engineering with a specialization in microelectronics.